PRESS RELEASE: Drummers, Producers, DJs, and beginners and experts alike will all welcome the superb newDTX- Multi 12from Yamaha. The most powerful all-in-one percussion device ever created, it brings the professional power, sound and creativity of the acclaimed high end DTX range to musicians at a highly affordable price. The understanding of musicians needs are immediately apparent when you power up theDTX-Multi 12and with its powerful inbuilt module and 12 on board percussion pads the device is completely self-contained. It's bursting with many of the high end features that characterise the DTX range and will be the choice of professional drummers the world over. A perfect tool for live performance, production or practice it's expected the instrument will have much broader appeal beyond the drumming fraternity. Feature packed, theDTX-Multi 12boasts over 1200 stunning voices in high quality covering drums, percussion and keyboard sounds, many drawn from Yamaha's professional Motif synthesizer range and many completely new. Up to 200 custom set ups can also be created and stored with ease to suit any musical context using all internal sounds and 42 types of effects. For established drummers theDTX-Multi 12will bring a huge new sound set and performance capability to current set-ups and compliment any musical setting. The unit is designed to easily integrate into an existing acoustic set up or act as a stand alone unit. DTX- Multi 12will also prove invaluable to composers thanks to the included Cubase AI 5" software which facilitates quick and easy computer connectivity. Performing at the highest level for pro players, a wide range of play modes ensure it can adapt to any style, up to four voices can be assigned to a single pad for simultaneous or sequential playback and a wide range of dynamic options are made available. Versatility is enhanced with 128 on-board phrase patterns covering a wide variety of styles and users can also record their own patterns and assign them to pads. A sophisticated click track function also allows players to control the unit instantly, ideal for live shows. TheDTX- Multi 12is perfect for computer musicians too, functioning as an excellent input device connectivity is simplicity itself via a single USB cable. The included Cubase AI5 DAW software facilitates the recording and extensive editing of MIDI data, it can also function as a high quality sample playback device with 64MB of flash ROM on board. For live use, the pads feel great and allow creative freedom, they can be played with sticks, hands, fingers and palms, totally responding to every dynamic nuance and for added creative power Hi-Hat controllers and kick pedal pads can be added if you wish to use theDTX-Multi 12as a compact stand alone electronic drum kit. 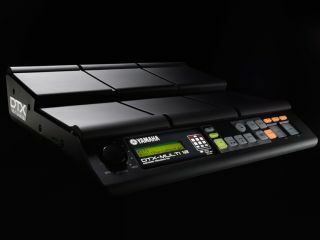 'The DTX-Multi 12 is the perfect tool to bring the many possibilities electronic drums can offer to any acoustic drummer or percussionist' explained product manager Gavin Thomas 'This launch is testament to Yamaha's extensive research into players demands and the first of many new exciting products currently in development'.